A great deal of reliable statistical data has long been available to the public eye — but it’s often been a challenge for resource-strapped nonprofit organizations to track down the information you need for policy development or to support your fundraising appeals with cold hard facts. UNdata has just made that research task a bit easier. A replacement for the old and unwieldy United Nations Common Database, the new UNdata website brings together all the major United Nations databases and those of several international organizations — including, for example, over 21,000 records from UNICEF on the state of the world’s children — in a single, searchable, internet environment. You can access this wealth of statistical data either by browsing the data series or through a keyword search. True, there's almost a baffling array of information available at UNdata, but keyword search results can be filtered by country and year to narrow the target. To conserve resources, a maximum of 50,000 records can be downloaded at any one time. 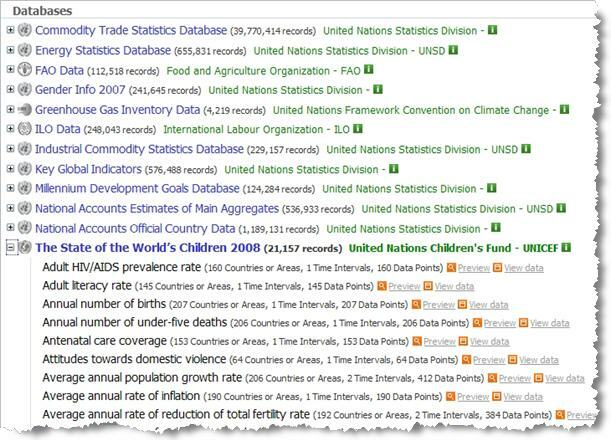 What kinds of statistics can you find at UNdata? For the most part, these are official statistics produced by various countries and compiled by the United Nations data system, as well as estimates and projections. Topics range from agriculture and industry to employment and education, from energy and the environment to health and human development, to technology, trade, and tourism. And it's all publicly available online, without cost. This will be so helpful in research for grant writing. Thanks!